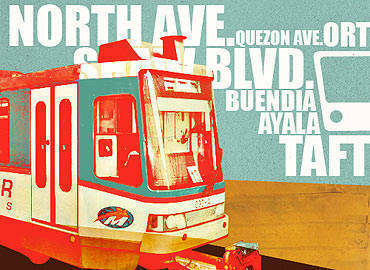 Peak hours, savvy tips, and a station-by-station breakdown to navigating the EDSA Blue Line without blowing your top. (SPOT.ph) Fun fact: while doing research for this article, we were mistaken for terrorists by MRT security. To be honest, you’d look suspicious too if you were hanging around MRT stations, jotting down notes in a small pad labeled with the names of all the train stops. A quick, painless questioning and a couple of phone calls later, we were good to go, but not without appreciating the security that guards a system that services over half a million passengers a day. Here’s an infographic on the crowdedness level of the MRT at three specific time periods during a typical weekday: the morning rush hour (7:00 a.m. to 9:30 a.m.), lunch (11:00 a.m. to 1:00 p.m.), and the evening rush hour (5:30 p.m. to 8:00 p.m.). Green - light to medium. There’s lots of space in the train (though passengers still bunch up a bit beside the doors). You could actually get a seat sometimes. Yellow - medium to heavy. The train is packed, but there’s still enough space in between the warm bodies to get in and out with just a minimum of fuss. Red - heavy to very heavy. Noticeable lines inside the station platform, passengers do their best sardines-in-a-can impression, and tempers are rightly flaring up. Note: The weekend rush will be slightly different from our chart. Here are our two cents’ worth of advice for those taking the EDSA blue line as part of their daily commute. Chime in at the comments section for your own tips below! 1. Buy an MRT Stored Value Card. If you use public transportation in the city with any sort of regularity, you owe it to yourself to buy one of these P100 cards. Despite all sorts of inconveniences, the MRT-3 is still the fastest, most cost-effective way to get through one end of EDSA to the other...an average of 30 minutes from terminal to terminal. Cut traveling time and hassle by buying the prepaid card: it lets you cut the massive ticket lines, it’s valid for three months, and it gives you a bonus last ride. 2. Know where you’re getting down. For now, a few general rules. If you’re getting off at high-volume stations like Ayala, Cubao, or Shaw, then it’s okay to stand near the middle of the train as it’s going to be fairly easy to get out (just follow the lead of other disembarking passengers). If you’re going down Buendia, Boni, and Shaw, then make sure you position yourself on the other side of the train as you’ll exit there. We’ll have specific deets for each station in our next section. 3. Know how you’re getting on. Again, we’re tackling this in detail in the next section, but you definitely have to know where to line up and how to get down to the train, especially in the larger stations (Taft, Ayala, Shaw, Cubao). The flabbergastingly long lines can confuse most train first-timers. If you don’t have a stored value card on you, then just make sure you know where to line up. 4. You can make a round trip, but only if you’re going northbound. If you have time to burn and you’re going northbound, you can skip the mega-lines and guarantee yourself a seat by taking a southbound train, and just switching over to the other train when you pull into the Taft terminal. If you’re really lazy, you can even just stay inside your own train and just wait for it to reverse. Since the North Avenue station has two separate boarding platforms for their trains, it’s impossible to roundtrip a southbound route, unless you’re a real jerk who uses the access stairway for the disabled and pregnant to sneak into the other side. 5. The best standing spot is at the back of the train. There are three advantages to scoring a spot at the back of the train. One, you’re near the doors. Two, you’re not blocking the doors and people don’t have to push you out of the way when they’re getting in or out. Three, you can lean on the end rail. Not as comfy as a chair, but hey, it will do. 6. The best sitting spot is right beside the door. For obvious reasons, naturally. But we actually prefer to stand during rush hour. Access is easier that way, and you don’t have to worry about creeps looming and leering over you. 7. If you’re carrying some form of luggage, lug it in front of you. Backpack bearers, we’re looking at you. Instead of slinging it over your back, transforming you into a clumsy creature whose bag collides with every living thing inside the train and eats up precious standing space, just hang it over one shoulder and hug it close to your front. You retain better control of your luggage, and you can guard it from unsavory characters who may want to open it up like a Christmas present. 8. Discipline yourself. See those painted signs on the platform floor, the big yellow ones with all the arrows? Yes, the signs that no one follows. Okay, hold on-it is improving. People are actually forming two lines during rush hour instead of the usual three to five. But they still stand in the spot that’s reserved for exiting passengers instead of off to the side as the arrows indicate. But you can set an example. If you’re first in line, queue up at the proper place. If you’re not, line up behind someone who is. 9. Be patient. We all know the complaints leveled against the MRT: the lines, the heat, the lack of trains, the non-functioning escalators, and a whole laundry list of deficiencies that make your daily commute a living hell. Off the train, complain all you want (make your voices heard, people! ), but while on it, keep your cool, don’t flip your lid, and don’t shout at security guards. We find that the best way to keep blood pressure down on the MRT is to look at all those buses snarled in EDSA traffic as you whiz by. 10. The first carriage isn’t really that bad. We’ve all heard horror stories of the barbarous babes that inhabit the special, exclusive "first" coach. They say that humid, female-only air of that carriage unlocks some sort of vicious chemical latent in every woman’s brain, transforming her from gentle commuter into savage, stampeding MRT zombie who will push and shove to get a spot into the train. Well, all that’s true-but at least the girls’ carriage smells better. Most of the 13 MRT stations follow a standard layout. There are two boarding platforms, one for southbound (going to Taft), and northbound (going to, um, North). Each platform is serviced by separate ticketing booths, and they have restrooms and stairs/elevators for the disabled. The two platforms are usually connected at station level by a pedestrian overpass or underpass. Stairs, escalators, and elevators can be taken from Edsa to go up to station level, though they usually favor one side. For example, escalators will usually be found on one entrance only, and not for the other. Access: The northbound platform connects to Trinoma, as well as the usual street-side access. Both northbound and southbound platforms are connected via a station underpass. Crowdedness: The southbound entrance can become very full in the morning: the line at the six ticketing booths force the guards to move the baggage check down to the stairs level. Amenities: As a terminal station, North has more stalls and ATMs than the usual. 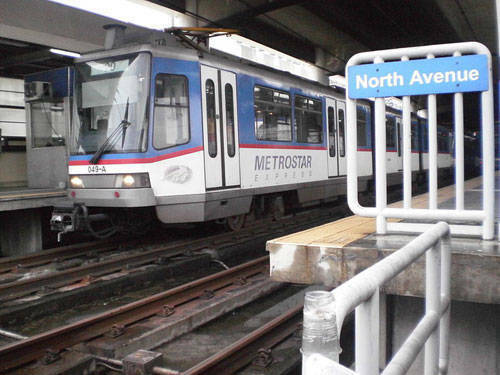 Access: The northbound platform connects with Centris Station. Northbound and southbound sides are connected via station overpass. Crowdedness: For northbound passengers, this spot is a sign of relief-after pulling out from this station, you can usually find a seat. Southbounders usually find that the train arriving from North station is still not so crowded, though lines will usually form at peak hours. Amenities: The usual suspects of Siomai House, Master Siomai, Mister Donut, with PS Bank and RCBC ATMs. Access: Both north and south platforms can only be accessed via stairs/elevator at EDSA level. Crowdedness: This is among the MRT-3’s low volume stops. Amenities: The usual suspects of Siomai House, Master Siomai, Waffle Time, with PS Bank and RCBC ATMs. Access: Both northbound and southbound platforms are serviced by a unified ticketing concourse. On both sides are stairs down to EDSA, while the northbound side also has a connection to Farmer’s Plaza. Crowdedness: As the access point to the LRT-2 and a major commercial center, you can expect Cubao to be one of the most crowded stations in the line. The nine ticketing booths are scattered haphazardly, which makes finding the end of the line quite difficult. At platform level, the hordes looking to board the train are also the most disciplined-maybe the guards are stricter about lines here? Amenities: There are tons of food booths to choose from here-including three Master Siomais. Yes, three. Crowdedness: This is quite probably the least-crowded station in the entire MRT line. Even at the peak of rush hour, we really couldn’t see any lines forming here. 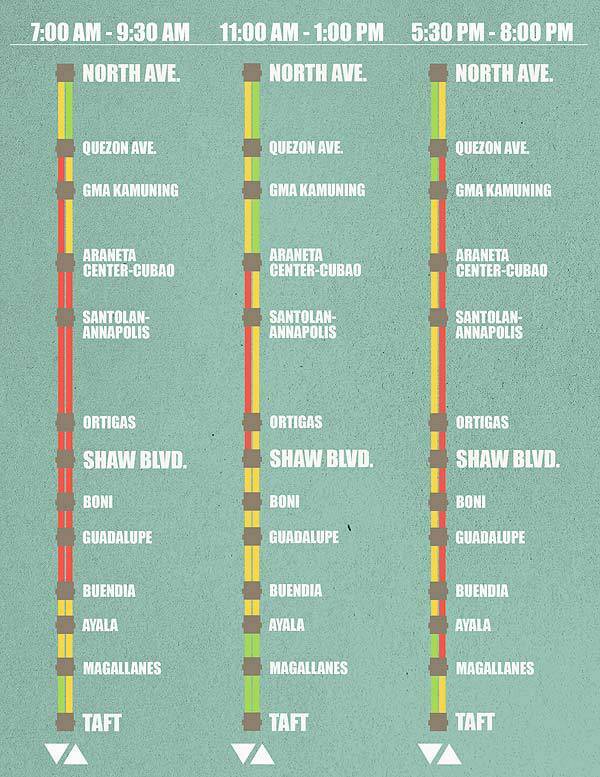 Amenities: Santolan-Annapolis definitely has the least stalls of all the stations. In fact, last we checked, it only had one: Siomai House on the northbound side. There are ATMs, though. Access: Thanks to iron railings on the sidewalks, the EDSA stairs on the northbound side can become crowded, even on light days. Its location is inconvenient; since it’s between Megamall and Galleria, you’ll have to walk a bit to get to the major commercial centers. Crowdedness: If you board a train here, be warned: the trains themselves are usually already full. Amenities: A fair amount of food stalls can be found here, including a Tiktilaok on either side. Access: Shaw Boulevard station is actually inside a grand old mega-complex that’s easy to get lost in. It has two access points on either side of Shaw Boulevard. One connects to Shangri-La Plaza mall, while the other leads to a warren of bazaars and stalls that connect to Greenfield District. You can even cross from one side to the other via open-air walkways on the side of the tracks. Both the Greenfield and the Shang sides have their own ticketing booths. Crowdedness: As a major terminal, many people get in and out in this station. Take note: you exit into a central island platform, so you get down on the other side of the train. Amenities: There are far more stalls in the Shang section, but just outside the gate of the Greenfield entrance is an Express Lanes by Shopwise. Access: Did you know that there are actually two ticketing stations for Boni? The one everyone knows is located just outside Pioneer, but the other is further down Edsa, near Reliance. It’s quieter there. Crowdedness: Like Shaw, Boni has a central island platform. Unlike Shaw, the platform is very narrow, and since both northbound and southbound passengers queue up on that narrow strip, it can get very crowded. Amenities: The Pioneer entrance definitely has more stalls. Access: Aside from the usual stairs and escalators from Edsa, the northbound side also connects to Guadalupe Commercial Complex. Crowdedness: Even at lunchtime, Guadalupe is a moderately busy stop. Amenities: The usual food stalls can be found in Guadalupe. 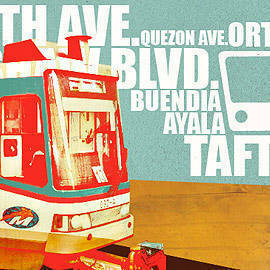 Access: Like Taft, Ayala, Boni, Shaw, and Cubao, one ticketing concourse serves both the North-bound and Taft-bound platforms. You can acess it via stairs on both side of Edsa, and a walkway that connects from Buendia. Crowdedness: It suffers from the same problem as Boni: the central island platform is just too narrow. Amenities: It’s a fairly no-nonsense station that doesn’t boast a lot of amenities. Access: Like Taft, Buendia, Boni, Shaw, and Cubao, Ayala has a central ticketing station for both northbound and southbound trains. The southbound entrance has lots of stairs, plus a connection to SM Makati, but the northbound side only has one stairway, which means a long line for anyone who wants to go down that way. Crowdedness: Naturally, the evening rush hour lines at the ticketing booths are intense: warm bodies trapped inside a maddening hotbox. Amenities: The most well-appointed of all the MRT stations. Mercury Drug? David’s Salon? KFC? It’s all there and more. Access: The northbound side has a connection to Alphaland Southgate Mall, plus stairs to Edsa. Southbound has the usual stairs from street level. Crowdedness: Magallanes is the equivalent of Q Av: a brief chance for southbound passengers to sit down before the last stop, and an accessible second station for those going to North. Amenities: The usual food stalls can be found in Magallanes. 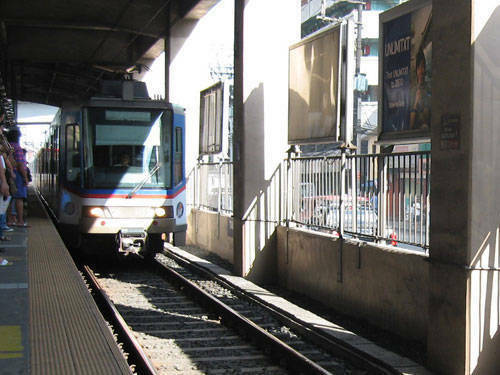 Access: There’s lots of ways to get in and out of the blue line’s southbound terminal: stairs, a walkway, and a connection to a bazaar on the southside, and in the north side, stairs to Edsa, a walkway to LRT-1, and a connection to Metropoint Mall. Crowdedness: The lines here, frankly, can get terrifying. During peak hours, queues start at the back of the ticketing booths. To alleviate the crowds, three more booths were opened that just sold prepaid tickets to select stations, but even that doesn’t seem to be helping. Amenities: The usual crowd of food stalls are here, with a smattering of cellphone accessories vendors by the northside entrance.